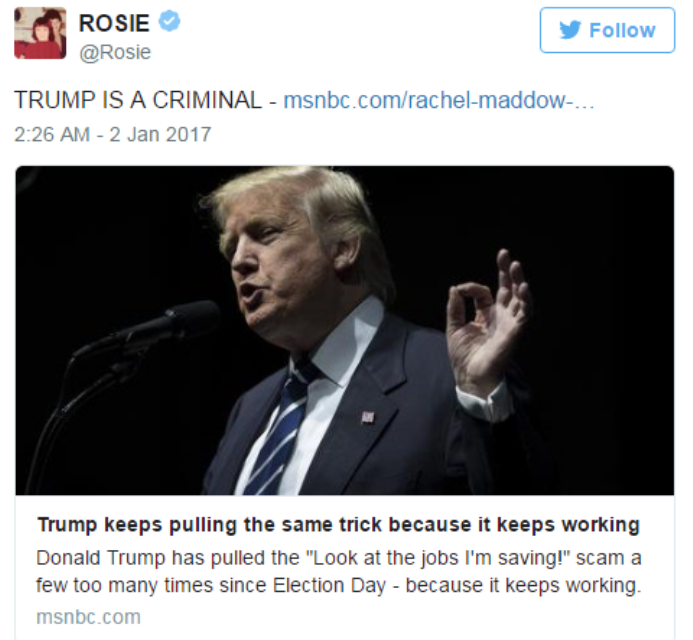 Los Angeles, CA, United States (4E) – Rosie O’Donnell once again took a jab at president-elect Donald Trump on Twitter as she called him mentally unstable and a criminal. The two have been feuding for a long time now and the comedian said in her tweet, “Donald Trump is mentally unstable… less than 3 weeks to stop him America.” She also shared a CNN interview of the Trump biographer, Harry Hurt III, who recently claimed that the president-elect kicked him off of the golf course at the Trump International Golf Club in West Palm Beach, Florida. Hurt said that he was kicked out because Trump was unhappy with his book. Aside from that, O’Donnell called Trump a criminal and shared a link about the president-elect that he will be saving American jobs once he takes the seat as the president of the United States. She also tweeted a Buzzfeed article about a photo series showing the statements of Trump written on women’s bodies. One Twitter user accused of O’Donnell of making false statements against Trump noting that the real estate mogul has donated a lot to charity. The comedienne then responded, "He is the cheapest billionaire ever. He is a fake and a fraud. He earned nothing. Daddy's money not his." It remains unclear what prompted O’Donnell to tweet about Trump but the two have been enemies in the past. Trump called O’Donnell fat and a real loser. O’Donnell in turn called Trump a turd .